In the game of Dominion you are now a ruler over a small kingdom. Your kingdom is full of rivers and trees, but you still hope to make it bigger and better. The board game Dominion is your chance to show your opponents how much bigger and better your kingdom can be. The only thing standing in your way are other rulers who want the same thing for their kingdom. Dominion is a race to get as much land as you can and create the biggest and best kingdom. Check out Dominion for a great strategy-filled game that will have you and your opponents battling it out. Play Dominion with your friends today! To win Dominion, be the player with the most victory points at the end of the game when the last card of the third emptied pile is gone. 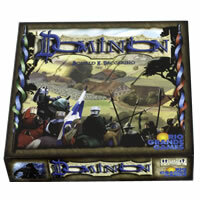 See the Dominion game rules and instructions. Please keep in mind that the official Dominion party rules and instructions could be different depending on the game version you have. The rules below are some of the exact directions on how to play Dominion. Share with us your comments, funny stories, tips, advice, strategies, creative ways to play, questions about how to play, problems with the rules or anything you want about Dominion. All submissions will be reviewed within 24 hours. Click here to add your Dominion comments. I just saw this on a top 10 list of most popular board games. I had never heard of it so maybe I've been living under a rock. I just glanced through the game rules and it looks rather interesting. I'll have to see if I can get my hands on one to try. This is the best game ever. I love strategy land based take over games. This one is on the top of my list. When you really play with someone that knows how to play well it can take much longer than 45 minutes. The game rules and a little daunting but that is what makes it so fun - all the details. I guess this can be a classified as a nerdy game but I don't care.